If there ever was a good year to take up birding in New Jersey, I seem to have picked it. Between a couple of intrepid finds and a tenacious desire to check out some rarities, we've seen a northern shrike, black bellied whistling ducks, reddish egret and a bunch of other interesting avian visitors that don't always come through this way. The fact that I've gotten to see some really cool birds in my first active year is testament both to Ivan's enthusiastic energy and a community of birders that's happy to share details on where to locate the notable visitors they find. Then there are the birds we didn't see, like the scissor-tailed flycatcher that was a no-show despite our six hour wait at a field in Somerset. Those are the instances that remind me that for all of the directions we might get from those who've spotted the birds, these creatures still have wings and come and go on their own schedules. Despite our desires, they're ultimately the ones in control of the situation. Case in point was our attempt to see a crested caracara that showed up in West Windsor last weekend. To be honest, we weren't even in the state, having taken a road trip to beef up Ivan's list of bird sightings in New England. Just our luck: a bird that's native to Texas, Florida and Arizona comes up to New Jersey for what might be the first time, and we're not here to check it out. We agreed that if the bird was reported to be hanging out on Monday after we returned, we'd make the drive to see it. Personally, I was eager to see a bird that Ivan described as looking like an eagle with a bad hairpiece. I'd come upon its listing in the Sibley guide when checking out the bald eagle from Hawk Rise, and I'd pretty much written off the chance to see it without doing some serious traveling. An hour to West Windsor was nothing compared with where I figured I'd have to go. Monday's reports were promising, but when we got to the appropriate farm acreage, the folks there hadn't seen the bird yet. The caracara reportedly had spent some time foraging through the alfalfa fields when it wasn't standing watch from a high perch, but it seemed to be away for the late morning and early afternoon. Maybe it only shows at the field at early morning and evening? Maybe it was walking amid the fields on the other side of the crest in the acreage, which we couldn't see from our vantage point. Frustrated, we drove around the area looking for other fields where it might be hanging out, our route taking us between open fields and residential subdivisions. No luck at all. I'd be lying if I said I wasn't disappointed. Our weekend birding expedition had been less than fruitful, and seeing a major rarity at home would have gone far in making up for our unsuccessful travels, but it wasn't meant to be. Then we decided to try again on Wednesday. By that time, the reports revealed a pattern: the caracara did, indeed, seem to be showing in the early morning and late afternoon. Perhaps if we got there just before rush hour, we'd get lucky. Jumping onto the Parkway that afternoon, we attempted to make the trip as quickly as possible. "It's the skinny pedal on the right," Ivan shouted out to a particularly poky driver ahead of us on the entrance ramp. "We've got a bird to see!" Because we'd taken this route before, the trip to Grover farm seemed a bit shorter, and we made pretty good time getting there. A few other birders were already parked at the appropriate location, spotting scopes, cameras and binoculars at the ready. Just from their stance, we could tell the bird wasn't visible, at least not yet. Crows were calling from a tree near the boarded-up farmhouse, leading us to wonder if they saw the caracara approaching, but their noise led to nothing. A merlin glided by, checking out the scene without finding the larger bird it had been hassling over the recent days, according to reports. Meanwhile, we were standing on a fairly well-traveled road, all aiming our optics in the same general direction, so it wasn't surprising that we got some inquiries from passing motorists. I have to admit, I was tempted to tell them we were tracking a spy blimp. Or it might have been just as fun to point to the empty sky and simply ask, "You mean, you don't see it, too?" Instead, some of the other birders explained what we were waiting for, and why it's so remarkable. Then... a dark streak flew over the field from the left. 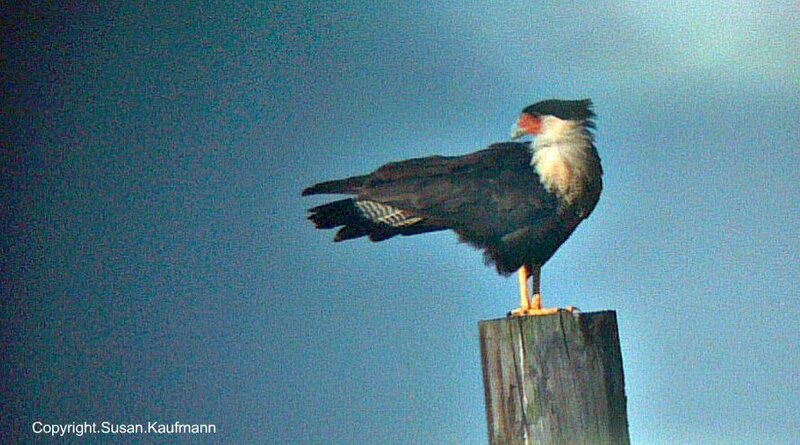 The white patches on the wings and the black cap on the head made it unmistakeable... it was the caracara. Just as he apparently had over the preceding days, he glided over and perched on a utility pole along the driveway to the farmhouse. There, he settled and preened while we watched. I was fortunate to get a few relatively decent snapshots through my phone and Ivan's spotting scope, but they don't really do the bird justice. There are several theories on how and why this bird came to a farm field in Mercer County. Some have questioned whether it might be an escapee from a zoo or wildlife handler, but it's not banded and has shown every sign of being able to handle itself quite well in the wild. Others believe that it may have been pushed in this direction by Hurricane Isaac, and that seems a heck of a lot more plausible to me. Whatever brought it here, we're very happy to have seen him. Sometimes persistence means returning for a second look, and sometimes, the effort in that second look is rewarded. It's also possible that the caracara's arrival will do something for its current home, the Grover farm. Purchased by the township of West Windsor in 1994, the farm, its house and some other buildings are currently sitting unused and boarded up, deemed to be too expensive to restore to use. Local residents and preservationists met in July to discuss ways to bring the property back to useful life, and perhaps the new bird on the block will bring additional support and interest in the farm. I doubt it will be very handy with a bandsaw or a hammer, but it surely could provide great publicity.